With the onset of Fall, my wedding season has officially come to a close. I am still in disbelief I had a wedding season at all! I had originally begun my business as a portrait photographer with no intention of venturing into weddings again - too much pressure! However, the offers kept coming and I couldn't resist. Flattery is a girls best friend. While weddings are an imense amount of pressure and a one shot deal, I love the rush and more importantly I love behing behind the scenes. I love spending so much time with the couple on their day, watching the reception hall get decorated and staying until the very end of the night after most of the guests have left. Planking. 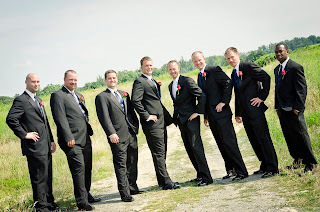 When we were out shooting the formals prior to the ceremony, my groom said, "Kelli! Get a picture of this!" In my old age (27 years young) I had no idea what planking was at the time. I thought to myself, this? Really? They told me it was some fad from England or somewhere in Europe. 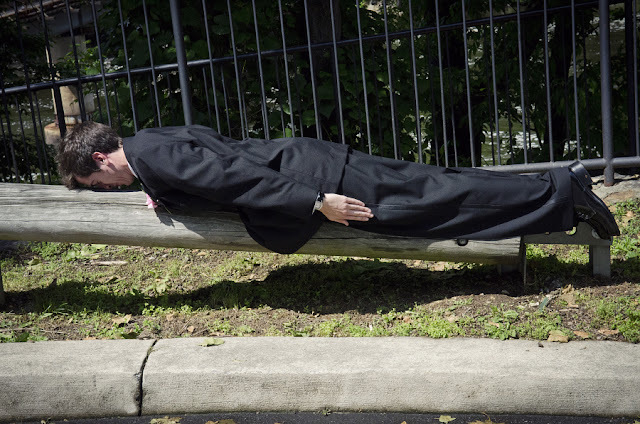 I took the picture at the request of the client and it was months later I found out what planking really was. Heck, they even devoted the opening of an Office episode this season to the fad. 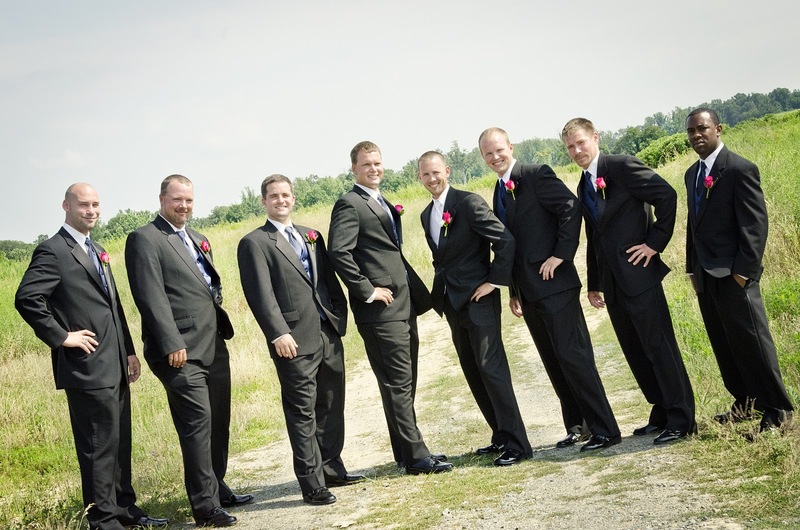 There is one particular position I like my groomsmen to stand in - "protect the junk", which is essentially just the hands clasped in front. I don't know any better way to describe it and it always gets a good laugh and gets the men to let down their guard. At Kristen and Johnny's wedding I used this technique and throughout the reception the groomsmen would say, "Protect the junk!" every time they passed. My brides have all been exceptional. They're all naturals. Really, with a beautiful bride in her dress all they need to do is smile to take a great picture. Still, that's a lot of dress. I find myself doing double duty a lot - fluffing the dress, fixing the hair, re-pinning a veil. 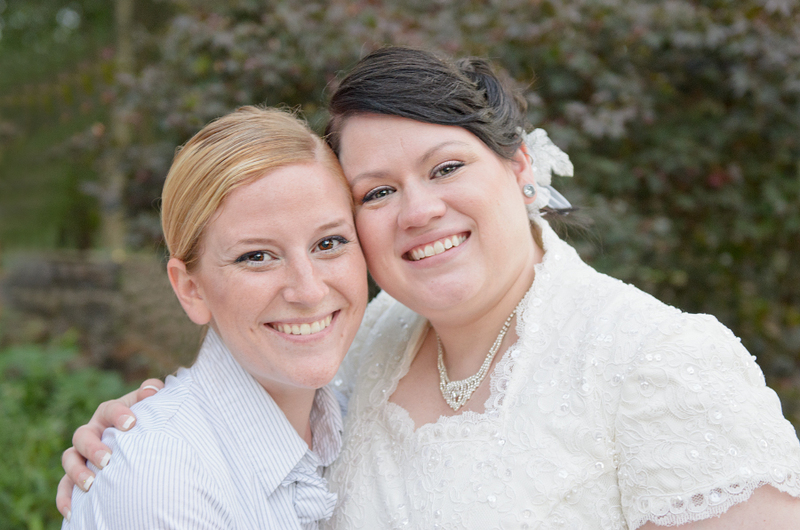 It's not everyday I get a lovely assistant but I was so happy to have Courtney to help me with Jessie's bridals. She pitched in lots of ideas, grabbed items when we needed them and helped keep the animals occupied and out of the shot when they weren't needed. 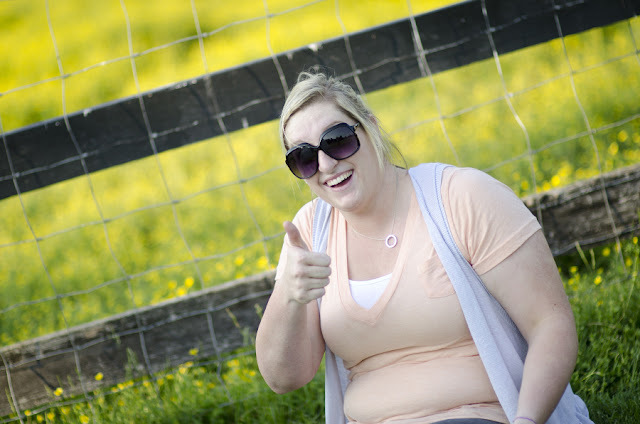 Oh, and tons of comic relief - she provided me with lots of natural laughs and smiles in the Johnson's photographs! I really enjoy the time that I get so spend one on one with my bride and groom on the wedding day. It's so amazing to see a couple on the ultimate romantic day. It's interesting to see the dynamic between a couple and why they fit together so perfectly. 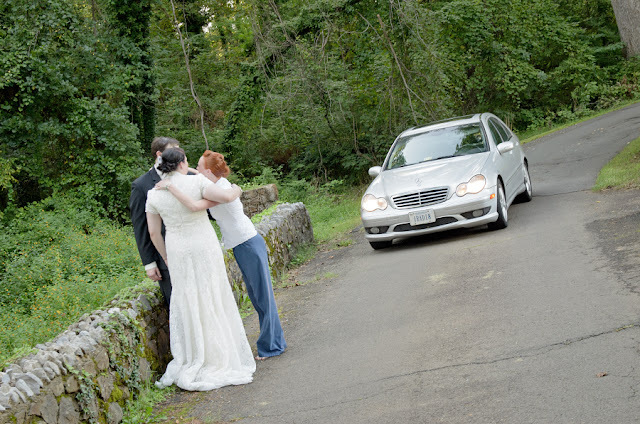 Occasionally there will be a few interruptions during our session of bridals before/after the ceremony. Last minute reception arrangements, bathroom breaks, hair/makeup adjustments. Prior to the ceremony however it's not out of the ordinary to run into guests who get a sneak peak at the couple before everyone else. At John and Lise's wedding there were 2 different ways to get to the reception hall and some guests happen to pop in while we were shooting on the road. 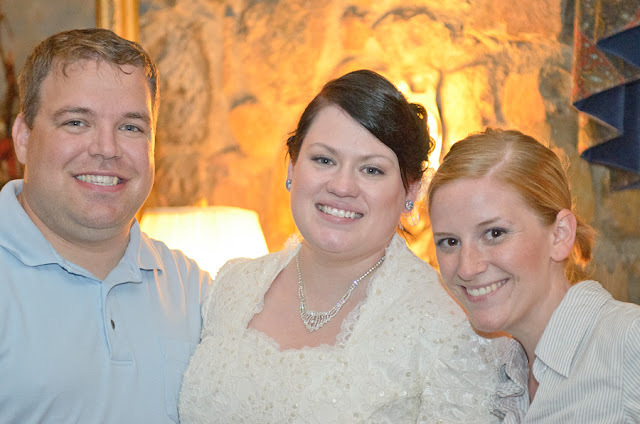 One such guest was Lise's maid of honor and our childhood friend Liese. She couldn't resist stopping and saying hello! I love seeing friends see the bride and groom for the first time to congratulate them. Oh - and did you notice Liese's license plate? She's a radiologist tech if that helps. The day after a wedding, I am sore. When I get home late at night after the reception is over I pop some Aleve immediately. All that standing, crouching and running around can really add up to a good workout! For the first 3 weddings of the season I wore the only dressy black shoes I had that weren't heels. They were cute and went with my ensemble for each wedding. They also gave me both blisters and bruises on the sides of my feet by the end of each wedding. Is it weird I was proud of them...? They were like badges of honor for a job well done! I finally invested in a pair of "work shoes" that were comfortable, stretchy and still fashionable with my uniform. I am always grateful to the DJs, staff, reception hall managers and even the bridal party for taking care of me during a wedding. From making sure I get a meal and even a few minutes to sit down. It was especially great to have Chance at multiple weddings where I could have a backup and assistant to help during busy times. Better yet - someone to eat with in a corner during a quick break! It is great to work with such a great friend. 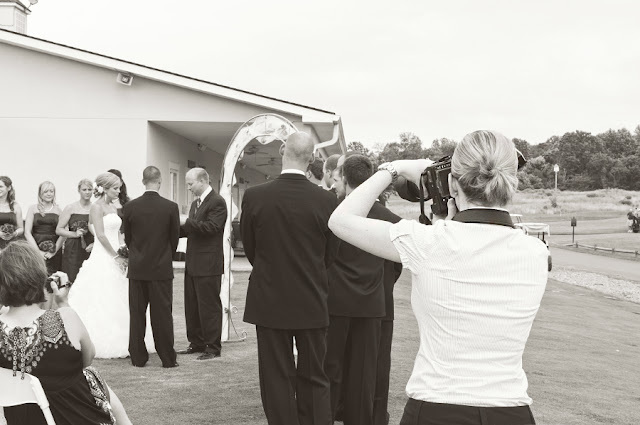 Not every wedding requires a 2nd shooter, but I'm beginning to think all my weddings require a Chance. As pivotal as my job is during the day, it really is important for me to blend in and not get in the way. I try to dress comfortably and appropriate for a formal occasion, but I stay businesslike and try not to draw attention with bright colors. I avoid going into the isle as much as possible during a ceremony but when I do, I crouch and tip toe as best I can - hence the Aleve at the end of the day. Before each ceremony begins, I always talk to the Reverend or officiant over the whole shebang. 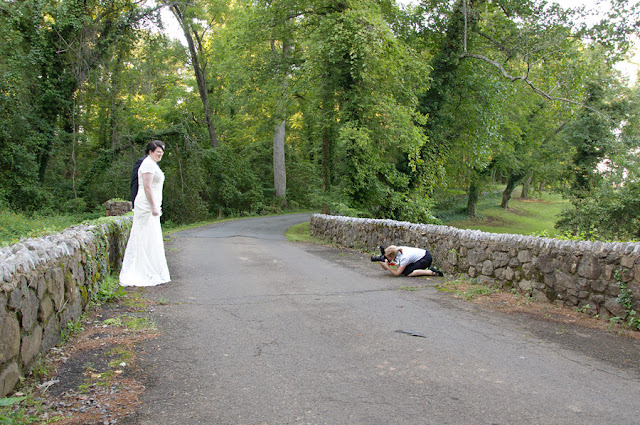 I've been told some officiants have strict rules about what you can and cannot do or some locations require you not shoot in certain areas, or even at all. That's what I've been told - so far, each officiant has said "Get as many pictures as you can!" 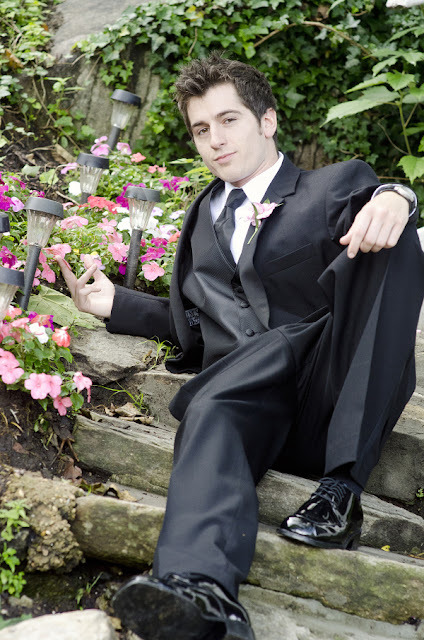 I've later asked guests if they considered me a nuisance or distracting from the bride and groom and so far, so good. Blending is the goal. It was a great wedding season. I learned so much from my couples and each wedding I shot. I loved the rush and feeling I had coming home late at night after a full day of work. 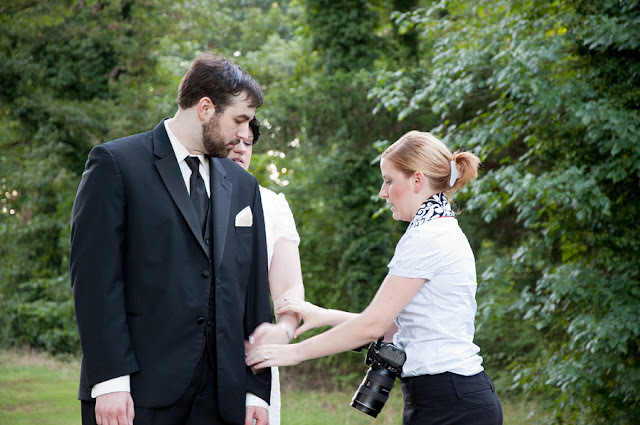 Working on weddings also helps me to appreciate my own marriage, which is going 6 years strong. Something about being surrounded by all that love and mushy stuff, and especially by friends and family who love and are so excited for the bride and groom... it just puts you in a good mood. I'm so grateful to all of the couples and families I worked with this year. 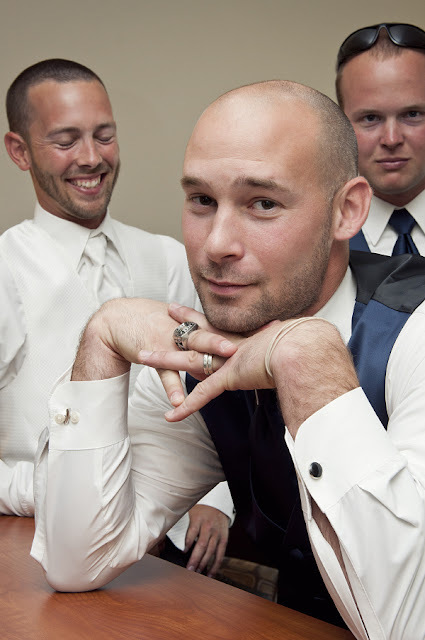 Grateful they trusted me to get the job done and to give this rookie wedding photographer a shot. 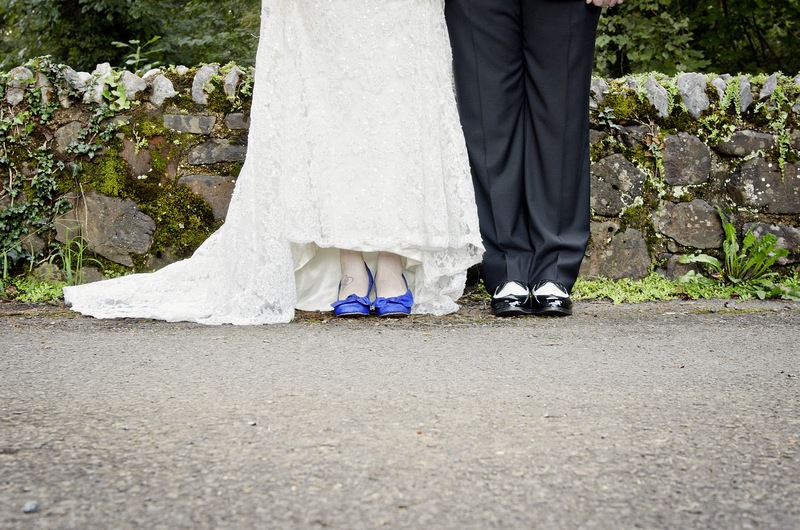 Photographing weddings has made me a better portrait photographer in all aspects of my work. 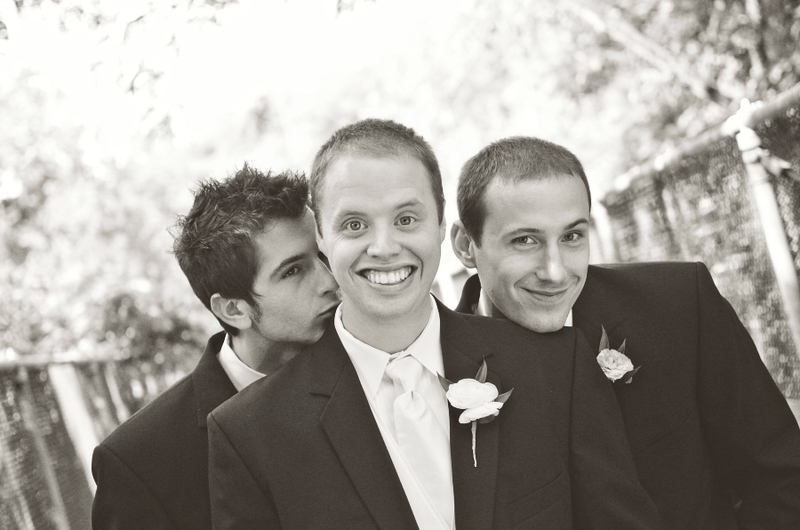 I have loved working with my friends and being a part of their special days. I hope that when they look back on their photos from their wedding day that they not only cherish the memories of what a fantastic day it was, but that they remember their little photographer too. I'm so very flattered! I'll happily be your second shooter anytime! I think every wedding needs a male and a female photographer. You and Chance seem to make a great team. 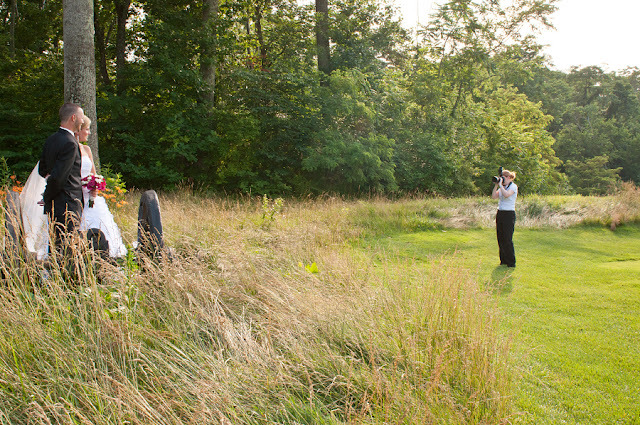 One of my favorite shots from my daughter's bridal sessions was the picture I took of someone taking a photo of the photographer taking a photo of the bride. It was a fun "behind the scenes" view. I really liked the photo Chance took of you doing the "shoe" shot.